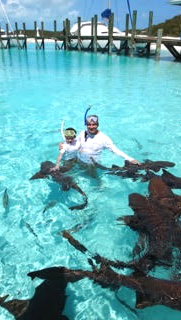 Looking for a different way to explore the cays to the north of Great Exuma? Consider a WaveRunner tour! 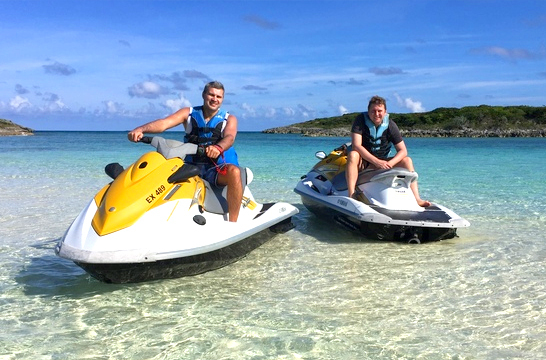 Exuma Water Sports offers a 2 hour, 35 mile guided tour on Yamaha WaveRunners. These bikes are highly stable and are very easy to maneuver, even for first time beginners. 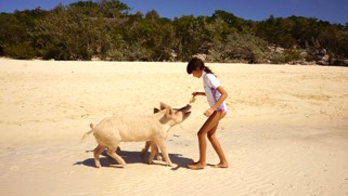 Cruise fast or slow to explore caves, extraordinary rock formations, blow holes all the while keeping an eye out for starfish, stingrays, maybe even a shark, and yes, swimming pigs! This tour is appropriate for all levels of experience and ages, however, children under 16 must be accompanied by an adult. Training will be provided by the highly qualified instructors, both on and off the water. Each WaveRunner has a dry compartment so that you can bring your camera to capture the sights along the way. Complimentary bottled waters are also provided. Tours depart from Barraterre. Advanced reservations are required. Transportation To & From Dock Included; pick up at the Villa Casa Del Mar. For an adventure of a lifetime take a tour of the Exuma Cays and experience the abundant beauty and sea creatures along the way. Boats leave from the docks in Barretere, approximately 35 minutes from Casa Del Mar. Advanced reservations are required. Available as a private tour only. *Please note the Captains may alter the tours depending upon weather and sea conditions. Deep-sea fishing, reef fishing, fly-fishing and spear fishing await you in the amazing waters of the Exumas. The flat waters on the South-side of the island are world-renowned for bone fishing; while the deep waters of the Exuma Sound on the North-side boast an abundance of marlin, tuna, wahoo, mahi-mahi, red snapper, and grouper as well as Spiny Lobster and conch. There are a number of certified local fishing guides on the island. Some guides rent fishing tackle for a separate fee as well. Please help us conserve our natural resources by following the fishing regulations out lined below. Vessels with a valid fishing permit are allowed 20 pounds of scale fish, 10 conch, and 6 crawfish (in season) per person, at any time. No grouper or rockfish weighing less than 3 pounds may be taken. No spearfishing within 200 yards of any island in The Bahamas. 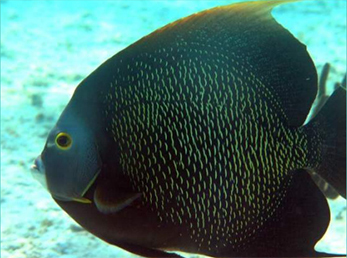 It is illegal to use any type of underwater air supply for spearfishing or collecting of any marine life. This includes scuba gear as well as air compressors. It s I legal for a non-Bahamian to use fish traps or to sell marine products of any type. No vessel shall have on board more than 20 pounds of any demersal fishery resources (groupers, snappers, etc.) per vessel at any time. The Queen Conch (conch) is considered to be an endangered species throughout much of its range within the wider Caribbean area, including The Bahamas. The Government, in an effort to ensure the continued sustainability of local conch stocks, has decided to prohibit the harvesting of the species by foreign boaters. Harvesting or possession of conch without a well formed lip is prohibited. Conch should be at least 7 to 8 inches long. Bag limit at anytime is 10 per person. The Queen Conch (Strombus gigas) which takes about 3-4 years to grow is protected by law in The Bahamas and should not be taken from the water. Closed Season.June 1 - October 15. Minimum harvestable claw is four inches. Harvesting of females is prohibited. The Bahamas completely prohibit the harvesting, possession, purchase and sale of sea turtles and their eggs found either within Bahamian waters or on any of its hundreds of beaches. Due to migration and temperature patterns, this scale can change, usually only slightly. All of these fish have been caught year round; this chart indicates the most common time periods. A golfer's dream! This 18-hole, 7001 yard course has been named among the best in the Caribbean by Travel & Leisure Golf. Placing the front 9 holes through scenic mangroves, Greg Norman took advantage of the landscape's natural barriers. The back 9 offer challenges of a different nature where the sea views create ample distractions from the focus of the game. The ever-changing course presents a worthy challenge for even the most avid golfer. Golfers will experience a new game each time they play and there are five different tee boxes to accommodate every skill level. Not included. Taxi or rental car is required. 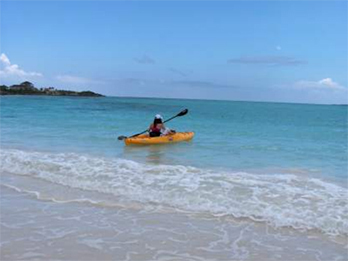 The Bahamas offers some of the best ocean kayaking in the world! 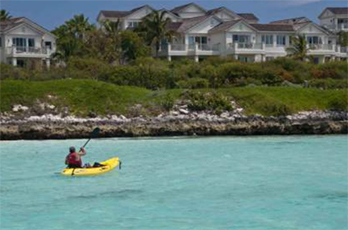 Starfish - The Exuma Adventure Center, is at the forefront of kayaking in the Exumas; offering the largest fleet of kayaks (single and double). Their skilled guides will lead you through crystal blue waters as you explore white sandy beaches, tranquil islands, and interesting marine life. Moriah Cay Tour:Take this 4-hour tour and be among the first to explore The Bahamas' newly designated National Park, Moriah Cay. 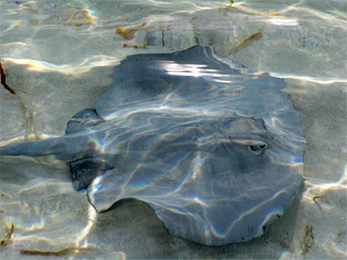 During this tour, the guide will lead you through blue waters and remote mangroves as you journey to Moriah Cay. 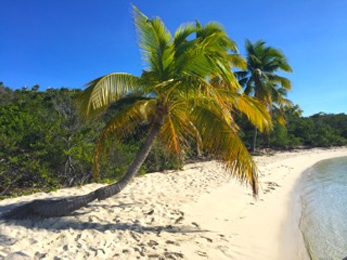 Upon arrival at the cay, you will have time to explore the beautiful beach or perhaps swim in its amazing waters. $70 per adult (age 14 & up); $55 per child (age 4—13); price includes bottled water and snacks. Elizabeth Harbour Tour:This is a nice, laid back, 4-hour tour of Elizabeth Harbour in George Town. 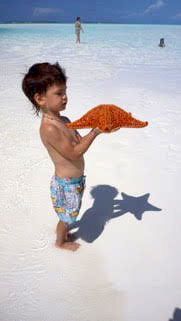 The guide will lead you across the harbor to Stocking Island where you will visit Starfish Beach, home to many of the giant Starfish for which Exuma is famous. Next you'll head to Hamburger Beach where you'll have the option to hike up to the salt beacon for incredible views of the harbor, or walk the nature trail to the Atlantic Ocean side of the island. $60 per adult (age 14 & up); $40 per child (age 4—13), price includes bottled water and snacks. Bring cash if you wish to purchase drinks and / or lunch on Stocking Island. Starfish offers group discounts on each of their tours. Groups of 6—9 will receive a 10% discount; groups of 10—12 will receive a 20% discount. A maximum of 12 guests can be accommodated on each tour. All tours are suitable for ages 4 & up and all skill levels. Ride the trade winds and frontal winds that make the Exumas a top kitesurfing location in The Bahamas November through April. Emerald Bay (the beach adjacent to Grand Isle), Coco Plum Beach and Rolleville offer some of the best spots to ride on the West end of the island. Moriah Harbor, below George Town, is a favorite among kitesufers as well. Off Island Adventures' Captain Stephen Cole (an avid kitesurfer himself), will be happy to show you some of the secret spots that are only accessible by boat. Visit their website for more information: www.offislandadventures.com; 242.524.0524. 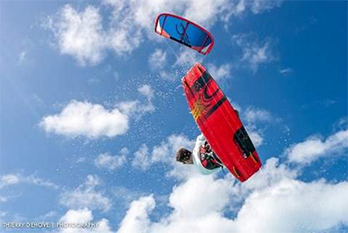 Never kitesurfed before, but want to learn? Check out Exuma Kitesurfing (www.exumakitesurfing.com/index.php, 242.524.7099). They offer kiteboarding lessons and kiteventures (kiteboarding charters) with personalized coaching for students of all skill levels. Their school is located in Rolleville, about 35 minutes from Casa Del Mar where they offer package and a la carte lessons. The beginner student goal is to achieve IKO intermediate level 2i kiteboarding certification by being able to determine wind direction, speed, and quality for a safe launch, practice the rules of the water with other kiters, set up kiting equipment independently, use and reset all safety systems, safely launch and land the kite, execute water relaunches, water start, work the board and kite in harmony for extended rides, control speed, complete basic turns and transitions, and perform upwind body dragging and self rescue techniques. This package includes Slingshot kiteboarding gear, helmet, harness, 3 hour land lesson (instructor/student ratio 1:4, 2 kites), unlimited power kite flying (trainer kite), 3 hour water lessons (instructor/student ratio 1:2, 2 kites), 2 hour private lesson (instructor/student ratio 1:1), 2 hour solo supervised practice session and 2 upwind boat shuttles. All lessons are held in waist deep water and sandy bottom locations. Also includes a Stand-Up-Paddle board session IKO/PASA certified (prices include kite, board, helmet, harness, and boat support). Spend a day skippering your own boat while exploring the coves and beaches of Elizabeth Harbour and Stocking Island. 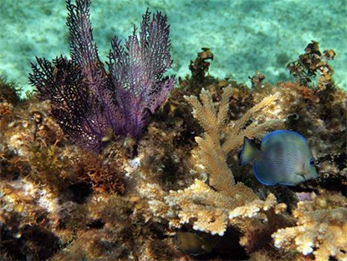 Snorkel the reefs and the blue holes, photograph the marine life or just enjoy a beautiful beach at your own pace. 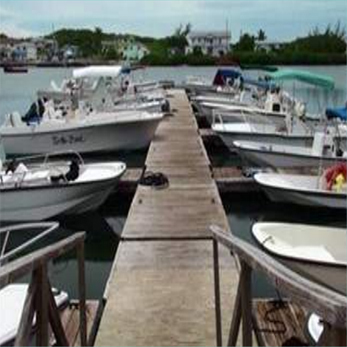 Minns Water Sports, located in George Town, offers a fleet of Boston Whalers and Power Cats. Rent your boat for the day, or several if you choose. Half-day (4 consecutive hours) rentals are available as walk-in rentals only. Please note all rental boats must remain in the Elizabeth Harbour area; they cannot be brought to the Emerald Bay marina adjacent to Grand Isle. If you'd prefer a guided snorkeling experience, join the Starfish Adventure Center for an exciting tour of several outstanding snorkel locations in the Elizabeth Harbor area near George Town. During this excursion, a variety of tropical fish, coral reefs, starfish, barracudas, stingrays, dolphins, and even turtles may await your discovery. All Starfish Adventure Center trips are small, intimate groups of 12 or fewer people, led by a trained guide. Or if you'd prefer to have the boat to yourself, book a private tour.